Six years after he beat Conor McGregor, the Donegal man predicts rematch between the two will happen in Croke Park. FIGHT WEEK IN Vegas, and another accomplished Irish MMA star is stepping up for the UFC’s opening card of 2016. 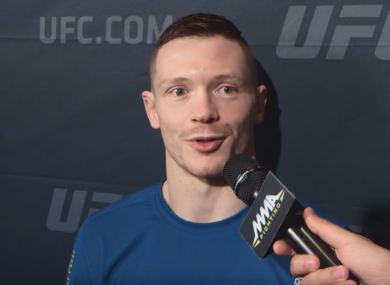 Yet 21 days after 2015’s second Irish invasion followed Conor McGregor to Nevada, Joseph Duffy won’t be backed up by vast hordes of holidaying green-clad MMA supporters. Duffy was born in the west Donegal town of Burtonport, but was moved to Wales for the formative years of his life and now trains in Montreal’s Tristar gym under Firas Zahabi. Despite his travels though, Duffy’s blended accent is enough to reveal how long he has spent in Donegal throughout his life and it remains an important part of his identity. Speaking with Ariel Helwani and MMAFighting this week, he was philosophical about the reduction in crowds and interest from the land of his birth for his third outing in the UFC. “Conor’s the one who has brought the spotlight to Irish MMA. he’s very outspoken and has a personality a lot of people are drawn to and brought attention to MMA in Ireland. On top of that, he’s fighting for a belt, a huge fight that’s been anticipated for a long time with the pull-out (by Aldo ahead of UFC 189). And obviously Christmas as well. Y’know, people are going to struggle to make Conor’s fight, Christmas and then come back out in the New Year. As McGregor immediately turned his focus from the featherweight belt to becoming a lightweight champion, six years on from Duffy’s submission win over McGregor in Cage Warriors, the two men are again in the same weight division. Duffy says that McGregor will “do well” as a lightweight and adds a rare prediction that next year could bring a massive UFC date to GAA HQ. “Without a doubt we could sell out Croke Park. it’d be like the Gaelic: Donegal versus Dublin. Email “Joseph Duffy explains why he doesn't get the same amount of Irish support as Conor McGregor”. Feedback on “Joseph Duffy explains why he doesn't get the same amount of Irish support as Conor McGregor”.